Today I want to openly declare to the current control system what Independence Day means to me and why it is the most important holiday of the year. Do you know what today is? That's right. It's the one day of the year where we the little people celebrate Independence from you the larger control system. That is after all at the heart of Independence Day. This is the day when individuals with a conscience, not groups like government and corporations but individual human beings get to reminisce on the idea of freedom. And how can we blame humans for doing that? Freedom, after all is the most prized right to yearn for. It's a right, it's a moral code, it's an expectation and desire that all humans quietly yearn for, hope for and dream of. Freedom from you, the government. Freedom from external control and manipulation. Freedom from coercion, intimidation and forced slavery based on fear of harm, fear of being robbed and fear of being locked up. All three of these threats are the essence of what government does, but you already know that. Governments exist to force others to behave in a certain way in order for that government to maintain its power over you. Whether it's the issuing of taxes, fines, imprisonment or even execution, the job gets done every time. Today we celebrate the concept of freedom from that very perpetual enslavement. This is after all the only true freedom that exists. Freedom from coercive and intimidating government to forcefully make you do something you don't want to do. 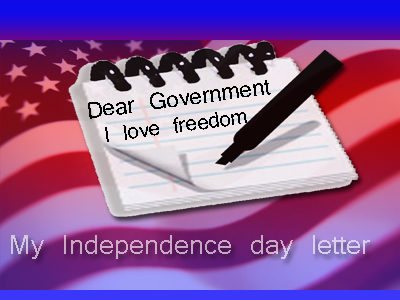 There is so much irony in having a nation celebrate "Independence" day just a few weeks prior to the start of Jade Helm 15 and in the center of a massive (Northwoods II style) push for the new world order of enslavement here in the U.S., but nonetheless I want to celebrate this day and remind you (government) that we all still cherish freedom from you. And no one should be surprised that during this day no one in government or mainstream media will spell it out and honor this day word for word for what it really stands for -- Freedom and Independence of the individual. That was, after all, at the heart of America's independence as reflected in the U.S. Constitution and Bill of Rights. Read it, review it and see the magic we little people see in it. Hopefully, it will inspire you and remind you what this is all about. They say there are two kinds of people in this world: those who want to be free, and those who want to control you. Which are you? Do you really want to be free yourself? Do you think you are already free because you work for government? Think again. If you had a choice to make a decision that encourages human freedom versus more government control which would you choose? Do you really understand the meaning of this holiday? Do you understand what is happening today, where we've been and where we are going? Do you truly understand the meaning of Independence Day? If you are part of government please take a minute today and meditate on this meaning. I say this only because humanity is in a state of emergency. Freedom really is threatened and the dangers of tyranny are looming greater than ever. The horrors of tyranny are about to repeat and, in fact, are already happening. Humanity, and America in particular, is on the verge of repeating costly mistakes of the past. The clock is almost at midnight and the time to stop this horrific road we are on is running out. Know that the essence of Independence is freedom; specifically humanity's freedom from the current control system that you work for. Find that quiet place, then ask yourself: What is life all about? Do you really think you are on earth to work for government then die? Do you think that the meaning of life is to work for government and help the control system? Don't you think there might be more to this journey that humanity is fighting for, and that might be why government's job is never easy? Have you thought about the history of humanity's resistance to tyrannical governments? Have you thought about where your place in history might be? Do you want to be someone who stood for humanity or government? Independence Day in America is indeed a special day. I'm thankful that we still celebrate this day even if government and its mouthpiece media gloss over it because it represents everything opposite of what they are trying to do to humanity now. I'm also thankful that I can still write this open letter and express my gratitude freely. I know that if government has their way all forms of free speech will soon be silenced. I know that freedom is not free and governments never stop reaching for more and more power and control. I absolutely realize the fragile nature of freedom and government control. The pendulum can swing in any direction from one day to another. So on this Independence Day please stop what you are doing and think. With the uncertainties we all face it's good to remember why we do what we do. I still live in America because I believe in freedom. I understand the principles America was founded on and I believe these are principles that help humanity thrive. I still believe we have every reason to fight for and stand for these principles. Think about those before you who have given their lives or their freedom for the sake of freedom. Many within government itself have died or been imprisoned fighting for what they believed was the right thing to do and we should remember these people and be inspired by them. If, however, you feel that your only purpose on earth is to obey government and help government carry out tyranny and control, then realize you are on the wrong side of history. You have today to think about the topic. Think about freedom and what it can do for you. Do you think you can do that for one day? Realize that there are many of us who can't even imagine living a life of slavery and we won't have anything but freedom. Realize that the idea we celebrate today is the greatest threat to a controlling government. Please don't underestimate freedom and how much some of us really value it. Stare at this Independence Day today face to face and remember what it means. Let the meaning sink in and don't forget how important this holiday is to many of us. When the government fears the people there is liberty, when the people fear the government there is tyranny.